Mel Gibson has become a name that is synonymous with controversy. In my opinion, regardless of what Gibson has said or did, it’s important to separate an artist from his work. For this particular film maker, he’s proven himself to be quite a talent with his most well known epic films being the modern classic Braveheart and the meticulously made Passion of the Christ. In 2006, Gibson took epic film making to a new level with his severely underrated film Apocalypto. Movies are a very exciting thing, and when one this huge is made with so much attention to small details along with a captivating and exciting story, I almost lose myself in thinking about it. This movie is a masterpiece. Jaguar Paw (Rudy Youngblood), who along with his father and many friends, is a hunter in the jungles of Central America during the collapse of the Mayan civilization. Jaguar Paw’s village is separate from all that as these people live a peaceful, secluded life. One morning, the village is attacked by a warrior named Zero Wolf (Raoul Trujillo) and his followers. They kill many villagers, but take many to bring back to the Mayan city either to be sold into slavery or be sacrificed to the gods. Jaguar Paw manages to escape from his Mayan captors and begins a chase through the thick Central American jungle to get back to his wife (Dalia Hernández) and son (Carlos Emilio Báez). With the vengeful Zero hot on his trail, Jaguar Paw has to think like a hunter once again if he’s ever going to see his family again. From the opening shot of the jungle existing naturally without any interference to the very last shot that bookends the film both visually and thematically, Apocalypto is a gorgeous movie. Shot on location in Mexico, very little computer generated images were used in favor of showing the natural majesty that these jungles have to offer. It makes for exciting chase sequences through the thicket and roaring waters. A lot of credit has to go to the stunt team for making these kind of high speed chases through territory like this possible. When the characters are in the Mayan city about half way through the movie, it’s even harder to believe that most of what is seen is not computer generated. Like the epics of the 1950s, including Ben-Hur and The Ten Commandments, the towering structures were actually built by a team of set designers. It’s an incredible sight to behold and made me feel like I was looking through a portal to a time long since past. I said earlier that the attention to detail is extremely impressive in this movie. Much like with The Passion of the Christ, all of the dialogue in Apocalypto is spoken in an approximation of what language would have been used in that time or place. In this case, the language is Yucatec Maya. It’s a decision that makes it so much easier to immerse yourself in the world that has been created. It’s obvious that this was one of the main intentions of Gibson’s from the very beginning. Other than taking the time to get this language down properly and film all the scenes with it, it’s important to recognize the costume design and make up. It boggles my brain how this movie didn’t get any Oscars for its costuming and make up. There are hundreds of extras in this movie along with the handful of main players, and each one of these people have a unique make up and costume design. This is an enormous undertaking and it’s a cinematic feat that I’ve never seen anything like before. While the story, itself, isn’t anything too groundbreaking or complex, it’s enough to keep the action and adventure moving at a quick pace. Apocalypto is not a short movie with it’s run time closing in on two and a half hours, but never was I bored throughout the entire movie. There’s a surprising amount of time building up the characters that will be present throughout the movie, and I was surprised by how much I really cared for Jaguar Paw and his family and friends. Once the attack happens the the villagers are taken to the Mayan city, the plot feels like it’s shot out of a cannon and the excitement doesn’t stop until the closing credits. Apocalypto is one of those movies that reminds me why I love movies so much. It’s kind of a cheesy thing to refer to movies as magic, but sometimes I don’t know what else to call them. 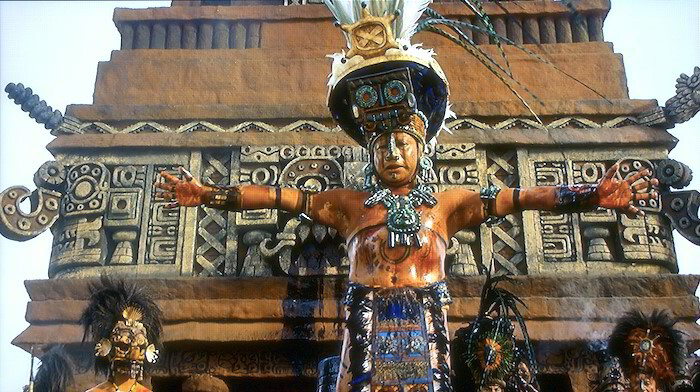 Apocalypto is pure movie magic and an achievement that is greatly under appreciated. The fine attention to detail mixed with loads of excitement, action, and adventure makes this a movie that I won’t forget for quite a long time.